Pearl Harbor reminds me of a time when America was united and at its strongest. On this famous quote you can read words like "overcome", "righteous might" and "absolute victory". It was a time when as a nation we resolved to do what was necessary to end WWII. Life has its horrific moments and when they occur we must let them bring us together and not drive us apart. The bible tells us that we overcome by the blood of the lamb and the Word of our testimony. There is no forgiveness without remembering the shed blood of Christ. He is our righteous might in trouble and when we follow His plan in our most difficult times, we will have absolute victory. 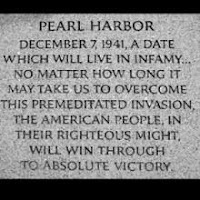 Today we remember all of those who shed their blood at Pearl Harbor and how this invasion made us as a people, indestructible and one nation, indivisible, with liberty and justice for all.